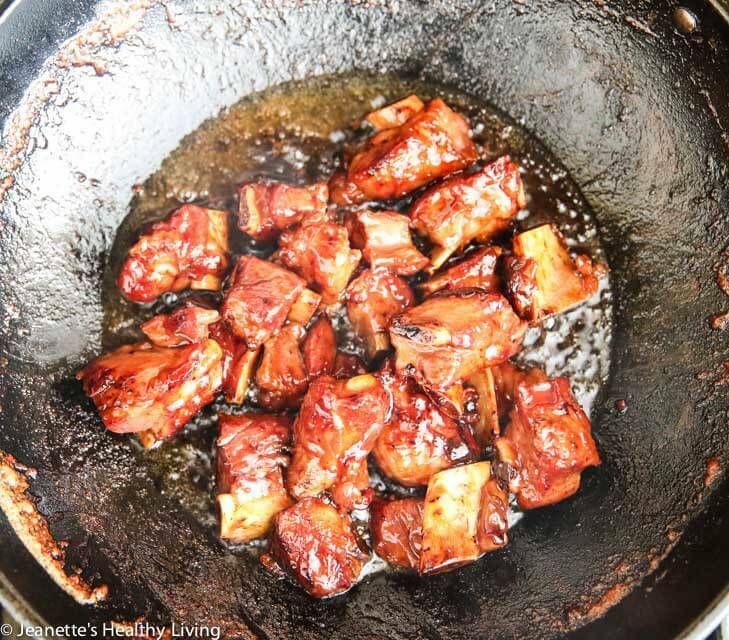 My Dad’s Chinese Sticky Honey Spareribs Recipe is a family recipe that has just 3 main ingredients – the trick to these sticky ribs is in the cooking process. Watch the video to see the cooking process. 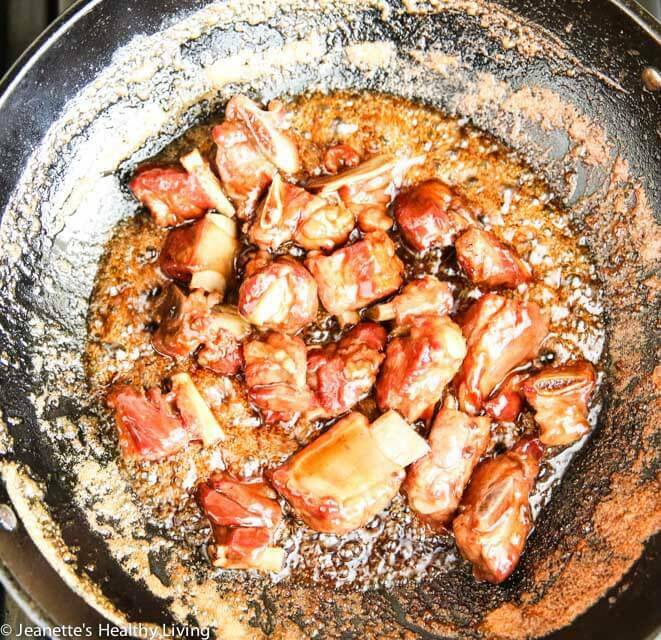 Growing up, my Dad had his specialty dishes that he’d prepare every once in a while, and these Chinese Sticky Honey Spareribs were one of them. 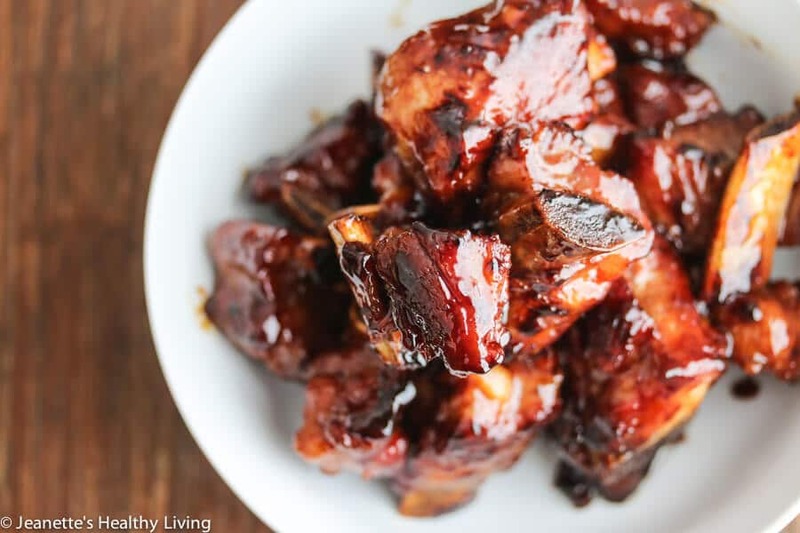 I remember the first time I made these – I couldn’t believe how simple the ingredient list was – simply spareribs, honey, soy sauce, and water, seasoned with a little salt. How would this magically transform into amber colored sticky honey spareribs? You have to try this recipe to believe it. Start by browning the spareribs on both sides. You can ask your butcher to chop the spareribs into 1 1/2″ pieces like I did. Next, add a mixture of water, honey, soy sauce and salt. Cook the mixture down until the liquid starts to evaporate. This is where you must start paying close attention. Pay even closer attention now. The magic happens during the last 5 minutes or so of cooking. The ribs are done with all the water has evaporated and the oil as separated completely from the ribs. Scoop out the ribs using a strainer. This is not a recipe that you can ignore during the last crucial minutes of cooking. If you do, you’ll end up with burnt spareribs. However, if you diligently watch over these spareribs as you should, you will be well rewarded. 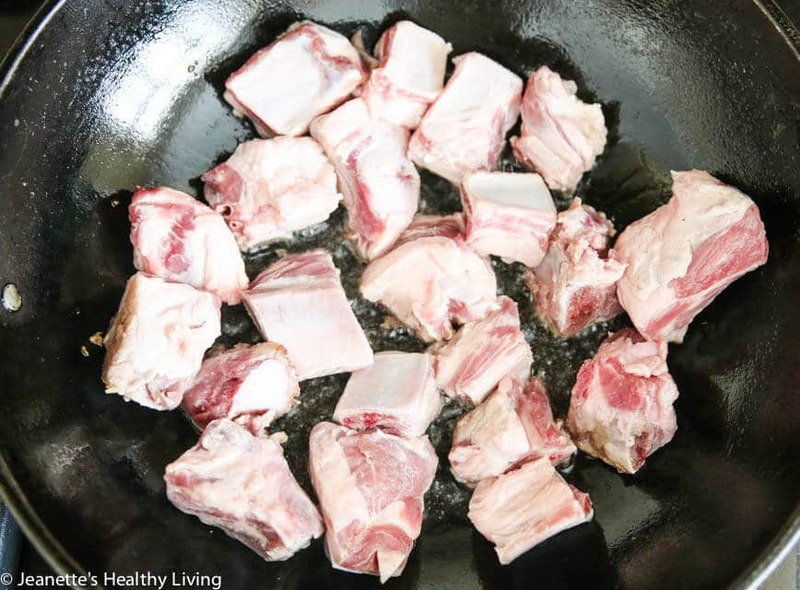 Wash and dry spareribs with paper towel. Place water, honey, salt and soy sauce in a large bowl and mix well. Heat wok or large saucepan and add oil. Add spareribs and brown on all sides over medium heat. This will take 5-10 minutes. Add water honey mixture and bring to a boil. There should be enough liquid to cover the spareribs. 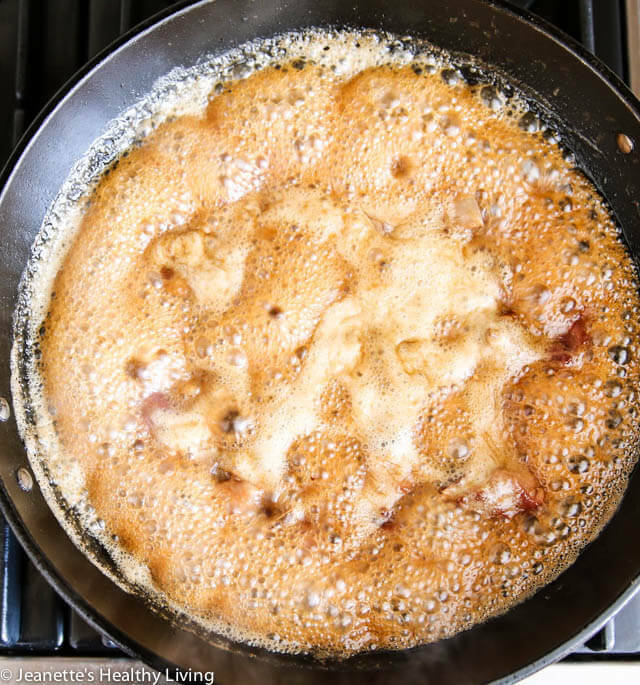 Cook over medium high heat until liquid is greatly reduced and sauce becomes thick and caramelizes. This will take 20-25 minutes. 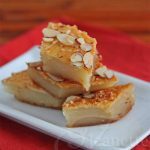 The final stage of cooking is very important as the reduced liquid caramelizes and will be burn easily, so pay special attention and watch carefully for this final stage. Turn the heat off as soon as the ribs are caramelized and remove the spareribs to a serving dish immediately. 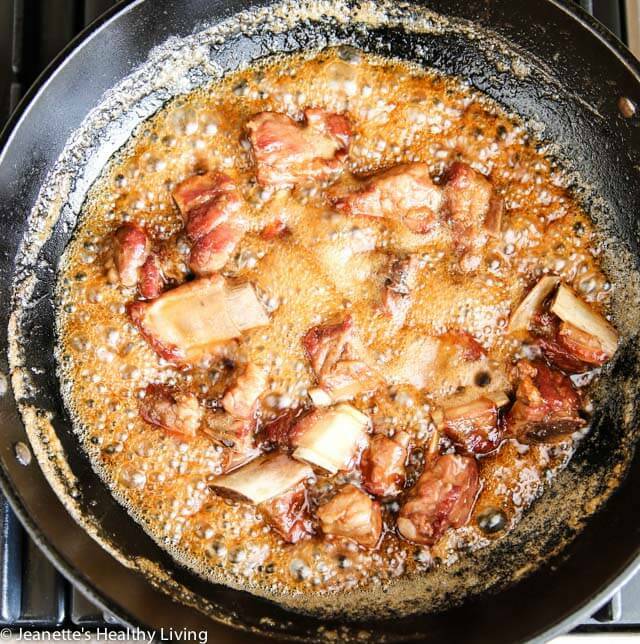 Stir the spareribs to carefully coat each piece with the caramelized honey sauce. Thanks Liz – I’m loving what everyone made for this month’s Progressive Eats! 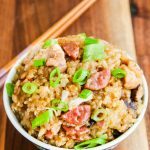 These were so easy to make and they tasted like we went to a fine dining Chinese food restaurant! I will definitely make them again. Don’t worry if you only have long ribs. I just cut some of the meat off and cooked the long ribs with the cut off meat. No problem . So glad you enjoyed my dad’s recipe! Thanks for sharing your feedback and method of cooking! Dang, Jeanette! These sound just wonderful! And what a great process–I can imagine that the end result is concentrated, sticky, flavorful deliciousness! Thanks for hosting our intrepid band this month! 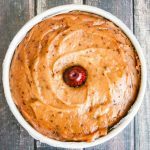 Thanks Jenni – yes it’s amazing how simple this recipe is, and how delicious the end result is! I love seeing how these are made. I wouldn’t have thought that’s how you do it. I thought it would take much longer actually. Yummy idea for a feast. Thanks Katie – the cooking process doesn’t take that long – the size of the ribs is key too – they have to be cut into smaller pieces. I bet these are so tasty- I love family recipes. Pinning to make! I would love to dig in to a plate of these. A perfect main dish for our feast. Thanks Barbara – everything on our menu this month sounds so good! 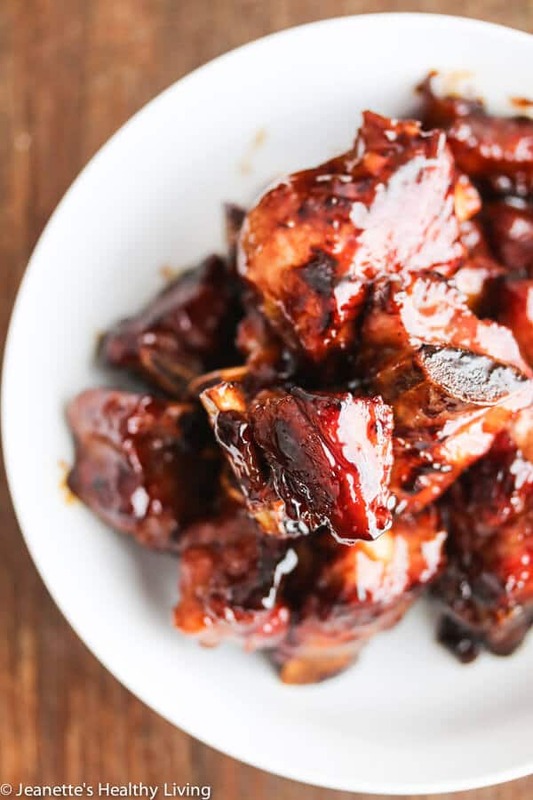 These honey spareribs look lipsmackingly delicious! Thanks Angie – they are! 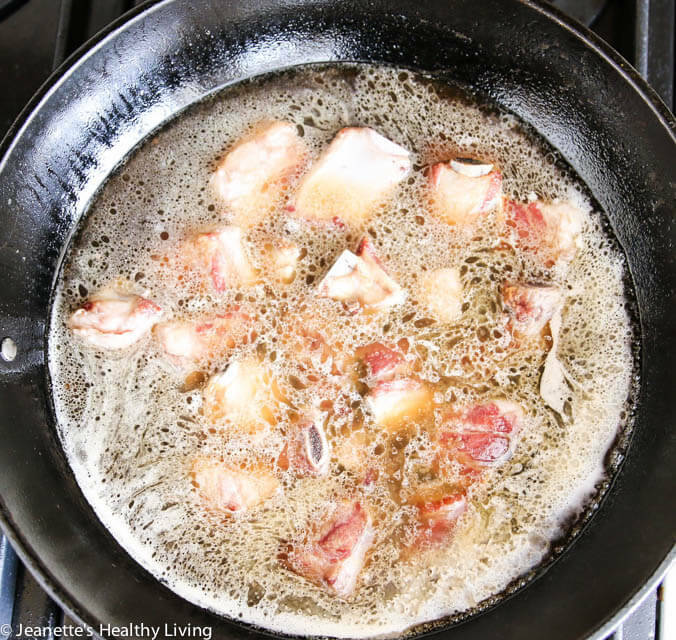 Jeanette, I am running out to the store asap to grab some ribs – what a fabulous and simple way to cook them! I’m a recent convert to wok cooking, so I have the passion of the newly inspired. I can’t wait to see the sauce carmelize and to get my fingers all messy. Oh good gosh – these ribs look insanely delicious…let the finger licking begin! Shashi – yes – finger licking for sure! These look absolutely incredible, Jeanette! Love the sticky honey sauce! Thanks Kelly! Hope you have a chance to try this recipe. These look delicious. Perfect for a party with close friends. Thank you for a wonderful theme this month. Thanks Ansh – loving the menu we all came up with this month! 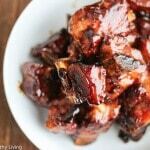 Jeanette, I LOVE these Chinese Sticky Honey Spareribs!!! and love the video!!!! that was great to watch that for this recipe!! Wow! Jeanette, these ribs look fantastic!! I agree, it’s really all in the cooking process. Sticky honey sauces make such a beautiful and delicious lacquer! And where are my manners!!?? 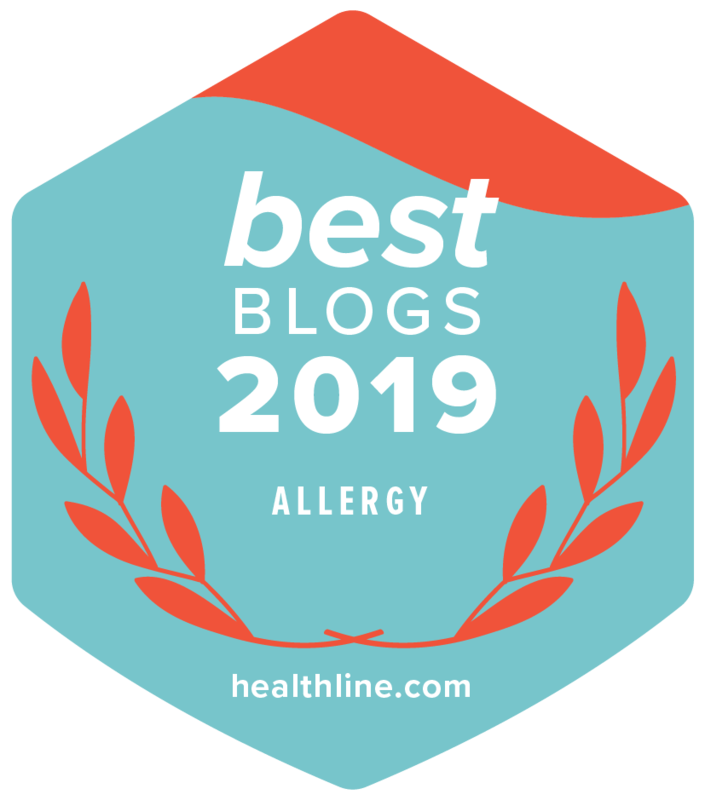 Thank you so much for hosting us this month! 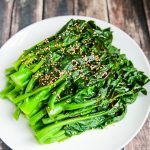 I stepped out of my comfort zone and tried some new ingredients and it was so much fun, thanks to you! Thanks for choosing such a great theme this month. spare ribs are my guilty pleasure! These would be great for a spring time bbq! Oh wow, these sound absolutely amazing. I love how beautifully lacquered they are when they’re all done. I desperately want to try them! I LOVED eating spareribs when I was a kid. They were my fave! I’m a vegetarian now but i have fond memories of me filling up on yummy spareribs! Ok, these ribs are glazed to perfection! I’m sure there would be no leftovers if my family got a hold of them! I love how easy these are, and my mouth is watering!! These look so good Jeanette. I really love how you have the ribs cut up in small pieces – so much easier to eat and more edges for the coating! This did NOT work…….plan and simple. I’ve used many pintrest recipes and this is the ONLY one that was NOT GOOD. Period. Amanda – so sorry this didn’t work for you. The end of cooking process is very important – the sauce will burn if not watched closely. I tried to include photos and a video to help with seeing how the sauce turns dark. At the very end, the oil will separate from the ribs – that’s when it is done – you have to remove the ribs immediately. It is a bit tricky. 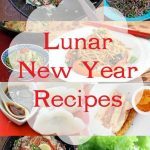 How do you get the recipes for the rest of the menu? 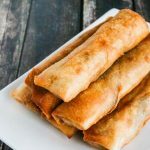 Jacqui, the links to the rest of the menu are at the end of the post – click on the name of the dish and it should take you to the sites with the recipes. Thanks for the “Sticky Honey Spare Ribs”, it is simple and delicious, impressive dish for family dinner. It will properly works for chicken drumstick chop up in a fairly large pieces. I think it is better that remove the “browning oil” and cook again with the ingredients. Hi Sue, sorry to hear this did not work for you. The ribs don’t actually taste much of honey. The honey serves as a way to make a sticky glaze on the final dish. The idea is to cook the ribs until the water completely evaporates. By the time the water is gone, the ribs should be tender and cooked through, and the ribs should have a sticky coating. Jeanette, thanks for a great and easy recipe. I wish I could post my pic of these ribs right now cus they’re beautiful! I have to be honest, I wasn’t sure if this was gonna turn out during the boiling down process and almost took the ribs out too early. But you’re right, those last 2-3 minutes are the miracle workers! Two things I did do differently for any commenters who are interested was that I eyeballed a 1/2tsp regular table salt as we didn’t have sea salt. Also, I parboiled the ribs first, but that’s cus I tend to do that for ribs and meats with bones because of the scum that comes out. That may affect the depth of penetration of the sauce into the ribs, but they still turned out very well for me. Thanks! 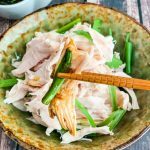 Hi Jo – thanks so much for your feedback on my dad’s spare rib recipe and for sharing what you did differently. 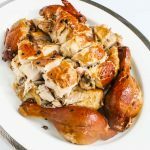 So glad you enjoyed this recipe – it’s one of my dad’s favorites and what he does best! Just cooked these and awesome! I cooked them for about 3 hours and they ate just delicious. Hi Melinda – glad you enjoyed these. Did you cook these on low? Just curious as 3 hours sounds likes a long time. Thanks! I just made this. I used the baby back ribs from Costco and cooked it according to the recipe but the meat came out overcooked and very tough. I like the recipe for its simpleness although I would omit the salt since the soy sauce is already very salty. I would also add a dash of Chinese 5 spice powder next time. You are right, the sauce burns so easily! When the sauce was halfway boiling I turned my back to do some other things thinking it will take a while to boil down. In less than one minute I checked again and it has started to burn. Hi Sandy, the ribs used for this recipe are regular ribs that have been cut crosswise into 1 1/2″ pieces. Baby back ribs are much leaner and not as thick, so I am thinking that might be why yours came out tough. 5 spice powder sounds like a great addition. 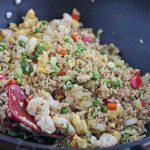 It’s a simple recipe, ingredient wise, but the cooking technique is a bit tricky. You do have to pay very close attention towards the end of cooking. I did not cut the ribs! I did realize that they are very lean but that was what I had in the fridge and I wanted to use up the rack. I usually make ribs in my pressure cooker and they always come out tender and almost falling off the bone. Do you think I can cook them this way and reduce the sauce separately, and then add the ribs to the sauce and just simmer everything for a little bit? Thanks. If you want to try to make the sauce separately, I would use just a little water and reduce the honey and soy sauce until it is just caramelized. The reason there is so much water in the recipe is it is used to cook the ribs. Let me know if you try it and how it turns out. Hi Jeanette! I was about to make these and as I was reading the comments, I realized babyback ribs aren’t good. Any tips on how I should modify cooking the recipe with the babyback ribs? 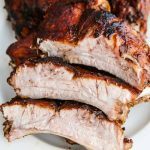 Hi Lorena – I haven’t tried making this recipe using babyback ribs. Babyback ribs tend to be less meaty and probably don’t require as long to cook. So, perhaps reduce the amount of water (the reason this recipe uses so much water is to cook the thicker ribs before the sauce is formed). amazing recipe! followed it exactly as written and they were perfect. such a wonderful, easy, whole food recipe. thank you!! So glad you enjoyed my dad’s recipe Trish! Thanks so much for letting me know – it will make him very happy! Thanks Karen – so glad you enjoyed my dad’s recipe – thanks for sharing how you prepared yours! Sarah – so sorry this did not work for you. The liquid is supposed to boil and cook the ribs until tender, before the glaze can form.